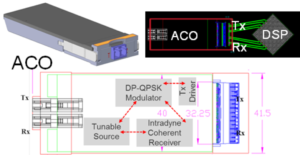 An ACO module used for optical transport integrates the optics and driver electronics while the accompanying coherent DSP-ASIC residing on the line card. The OIF completed earlier this year the specification of the CFP2-ACO. Current CFP2-ACO modules support single-wavelength transmission rates from 100 gigabit to 250 gigabit depending on the baud rate and modulation scheme used. The goal of the CFP8-ACO is to support up to four wavelengths, each capable of up to 400 gigabit-per-second transmissions. “This isn’t something there is a dire need for now but the projection is that this will be needed in two years’ time,” says Karl Gass of Qorvo and the OIF Physical and Link Layer Working Group optical vice chair. OIF members considered several candidate optical modules for the next-generation ACO before choosing the CFP8. These included the existing CFP2 and the CFP4. There were some proponents for the QSFP but its limited size and power consumption is problematic when considering long-haul applications, says Gass. One difference between the CFP2 and CFP8 modules is that the electrical connector of the CFP8 supports 16 differential pairs while the CFP2 connector supports 10 pairs. 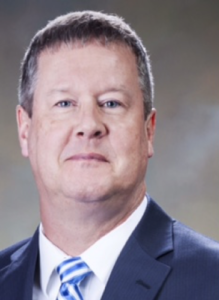 “Both connectors have similar RF performance and therefore can handle similar baud rates,” says Ian Betty of Ciena and OIF board member and editor of the CFP2-ACO Implementation Agreement. To achieve 400 gigabit on a wavelength for the CFP8-ACO, the electrical connector will need to support 64 gigabaud. Betty points out that for coherent signalling, four differential pairs per optical carrier are needed. “This is independent of the baud rate and the modulation format,” says Betty. So while it is not part of the existing Implementation Agreement, the CFP2-ACO could support two optical carriers while the CFP8 will support up to four carriers. “This is only the electrical connector interface capacity,” says Betty. “It does not imply it is possible to fit this amount of optics and electronics in the size and power budget.” The CFP8 supports a power envelope of 20W compared to 12W of the CFP2. The CFP8 occupies approximately the same area as the CFP2 but is not as tall such that the module can be doubled-stacked on a line card for a total of 16 CFP8-ACOs on a line card. Given that the CFP8 will support up to four carriers per module – each up to 400 gigabit – a future line card could support 25.6 terabits of capacity. This is comparable to the total transport capacity of current leading dense WDM optical transport systems. Rafik Ward, vice president of marketing at Finisar, says such a belly-to-belly configuration of the modules provides future-proofing for next-generation lineside interfaces. “Having said that, it is not clear when, or how, we will be able to technically support a four-carrier coherent solution in a CFP8 form factor,” says Ward. Oclaro stresses that such a high total capacity implies that sufficient coherent DSP silicon can fit on the line card. Otherwise, the smaller-height CFP8 module may not enable the fully expected card density if the DSP chips are too large or too power-hungry. Besides resulting in a higher density module, a key OIF goal of the work is to garner as much industry support as possible to back the CFP8-ACO. “How to create the quantity of scale so that deployment becomes less expensive and therefore quicker to implement,” says Gass. The OIF expects the work to be similar to the development of the CFP2-ACO Implementation Agreement. But one desired difference is to limit the classes associated with the module. The CFP2-ACO has three class categories based on whether the module has a limited and linear output. “The goal of the CFP8-ACO is to limit the designs to single classes per wavelength count,” says Gass. Gass is looking forward to the CFP8-ACO specification work. Certain standards efforts largely involve making sure components fit into a box whereas the CFP8-ACO will be more engaging. “This project is going to drive innovation and that will drive some technical work,” says Gass.